Cathy Norton, VMAS sustaining member from Indiana, took a special trip to Stuart, Florida to reflect and revel in the life and career of a very special person in her life-- Mr. Vaughn Monroe. Below is Cathy's log of the sites and experiences she had while in Stuart, and her tribute to Vaughn Monroe. The trip south from Fort Wayne had gone very well. Sunday, the 19th of April, 2015 was a beautiful day, just right for finding old memories and making new ones. 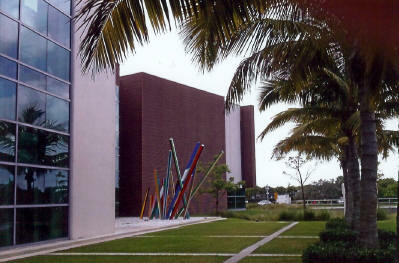 The Elliott Museum was the first stop. This beautiful facility opened in 2013. The desk staff and volunteers were so helpful and kind. It had been 10 years since that last gathering of the Vaughn Monroe Appreciation Society in Stuart so there had definitely been changes. I was directed to the motorcycle and automobile section of the museum. There it was! That 1951 Indian, complete with a write up about Vaughn’s association with the company and that particular Indian. Also there was the Movie Poster of “ Singing Guns.” A kind gentleman took my picture (to prove I actually was there). In inquiring about the ’59 Mercedes Roadster, I was informed that it had been removed from display because the condition has deteriorated badly. It needs thousands of dollars to bring it back for display. Sidebar: There is a very interesting display for automobiles. A list is posted of those available to see. A button is pressed for the one you would like to see and a conveyor system brings the auto front and center for perusal. Don’t know how long it stays there but probably a minute or two. This is where the roadster will be displayed when/if it is restored. I then went upstairs to investigate the rest of the museum. There is a very good collection of baseball memorabilia. Stuart is in the middle of the spring training area for Major League Baseball. The docent there, a gentleman named Frank, was very generous with his time with me. He had heard me asking questions about Vaughn and took me around the corner where there is a life size carved Indian. He said the museum thought it had belonged to Vaughn. I told him I didn’t know about that, but I did remember there being an Indian headdress of some kind that was presented to him during his association with the Indian motorcycle company. Frank also told me of his volunteer time at Martin Memorial Hospital. 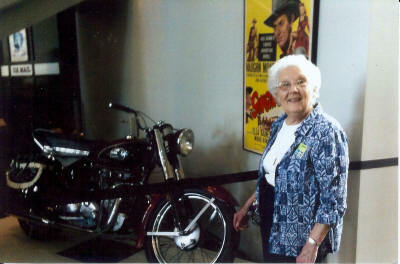 Marian was still volunteering until well into her nineties. She would drive up in her light blue Cadillac and motion (crooked finger) for him to follow her. He, in the golf cart, would then follow her to her parking place and proceed to drive her back to the hospital entrance. He was quite impressed by her dedication to the work of the hospital. A most business-like but genteel woman, he said. Sidebar: I would have loved to have been able meet her and talk to her. She was a woman who was ahead of her time. There is also an entire room devoted to Frances Langford since Stuart is her hometown. Lots of memorabilia of her life and career (including a few of Vaughn) and the OUTRIGGER. The OUTRIGGER was a restaurant and bar on the water that she owned and ran. Celebrities who came to town frequented the establishment. Vaughn was known to be frequent guest during the five years he lived in Stuart. The restaurant is named something else now. 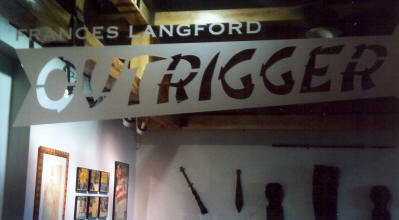 Miss Langford died and 2005, I believe. I inquired about somewhere to eat lunch and the head docent directed me to a restaurant where I had excellent fried oyster roll. MMMM good! Then to Martin Memorial Hospital where I found other changes had taken place. The entire ICU waiting area has been renovated (just completed). The cabinet with the tribute to Vaughn that had been in there has been removed. The staff at the desk didn’t know about any of it. I called back on Monday and spoke to the head of volunteers and she said she would call me with updated information. According to what she was able to find out it turns out that when the cabinet was removed most items were returned to the family after Marian’s death. There are plans to put his red jacket and Marian’s plaque (picture?) of service in the board room when the renovation is complete. An entire new wing of the hospital is named The Frances Langford Heart Institute. In talking with a volunteer she commented on what a wonderful, generous person she was. St. Mary’s Episcopal Church where Vaughn and Marian attended was right around the corner so I stopped there for a photo op. Obviously quite a bit of renovation had been done there also. I was able to talk to the vicar, but she was too young to know anything personally, but remembers hearing from older members talk about Marian and Vaughn’s time there and their efforts to make fundraising events a success. It was another gorgeous day and time to find that beautiful home. No problem. The addition “High Point” is very easy to find. The ride down High Point Road to 91 past those other homes was very enjoyable and at the very end around the corner – there it was. It has been taken care of very well. I stopped to look and take a few pictures. I just sat in my car. There was a home for sale across the street so I figured if anyone said anything I could say I was interested in that home for sale. Now it was time for a tour of old town Stuart. Took a ride in a free golf cart with a driver very interested in getting the word out about Stuart. After the riding tour, I then just walked and window shopped and took pictures. The driver had given me a tip about a restaurant right on the water that had excellent seafood so off I went to find Spoto’s Oyster Bar. Oysters on the half shell followed by fried oysters made me need to walk some more -- just down the street for ice cream. Have I mentioned that I have eaten VERY well on this trip. Now, the best and the saddest part. I made my way to the Fernhill Cemetery office to find out exactly where Marian and Vaughn were buried. . . a very kind gentleman led me to the place. He says that there are still quite a few visitors to ask about the Monroes. He also directed me to a Publix for flowers. When I returned to get the little metal vases to stick in the ground, he even took the flowers and cut them for me. 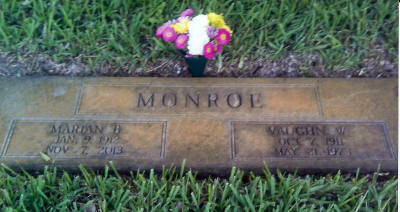 I then spent some time at the gravesite saying goodbye and shedding a few tears. This man is so special to me. I fondly remember having seen his show as a high school senior, leading him outside (at his request) for an autograph session. He was so patient as he talked to everyone and asked about OUR plans. Fast forward ten years. My husband planned a surprise birthday dinner at the Hyatt Regency in Atlanta and requested the song “Blue Moon” to be sung for me. It was! You would think that should be enough for him to be a very special person to me. NOT SO. At one point in my college career I wrote a note to Mr. Monroe and a personal reply just blew me away! “Learn the music and then sing the MEANING of the words TO your audience.” That advice has stood me in good stead ever since. My journey was not over, but the main reason for making the journey had been accomplished. Therefore, there will always be a place in my heart for "the man and his music."